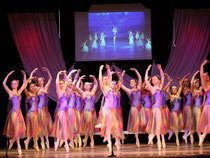 With its graceful, flowing and precise movements, ballet is the foundation for all the other dance disciplines. It aims to develop an understanding of stance, placement and turn-out, as well as an understanding of how to avoid injury. Tap is performed using precise rhythmical patterns of foot movement and tapping. Our Classes build up a vocabulary of steps to provide a repertoire of combinations, developing competence in differing tap styles, versatility and a sense of dynamics in performance. Aims to develop flexibility and strength to enable performance with energy, speed, stamina, co-ordination, body awareness and control whilst still allowing freedom of musical expression. Classes also can build the confidence necessary for auditions and the ability to work in many varying jazz dance styles.